Hanging out with Beauty and the Beast – my favorite! Good evening, readers! 🙂 I hope everyone had a fun St. Patrick’s Day yesterday and is enjoying this wonderful week. This weekend, I went to Epcot’s Flower and Garden Festival! I planned my entire future at Spaceship Earth, practically cried tears of excitement watching the manatees in the aquarium at the Finding Nemo ride, went to dinner in Italy, and took more pictures in the park than I know what to do with. It’s crazy to think that I live so close to Disney but so rarely go. Do any of you live near major tourist attractions? Do you visit often or do you steer clear? Here’s our latest batch of link love. Feel free to add your own favorite links to the comments section below! This 2-minute video, which chronicles the eight dates that led to Chris and Whitney’s engagement on The Bachelor this season, reminds us just how ridiculous the show really is. BuzzFeed has composed this hilarious list of 11 stock image models who probably now regret their choice in career. As a big fan of awkward stock images, I couldn’t stop laughing! Check out my latest guest article for Career Camel, all about what not to do in an interview when you’re trying to land a job! I’ve been doing a lot of spring cleaning lately, so I loved this Yes & Yes article on how to spring clean your mind and life. The Laughing Medusa shares some great tips on how to create a champagne life on a lemonade budget. One artist wrote a book filled with life advice from her dog, Wilma. The book looks awesome, and I loved reading this Q&A with the author in The New York Times. These cabbage “steaks” from Rockin’ Mom’s Kitchen are to die for. Rejection isn’t always the worst thing. Here are six ways to handle rejection and grow from it. Speaking of rejection, check out my article from a few years back about strength and vulnerability, and how the two can go hand-in-hand. We need to stop talking about real women. Here’s why. For those looking to begin a Whole30 or paleo lifestyle, check out my suggested kitchen staples and tools! It will make your life so much easier. 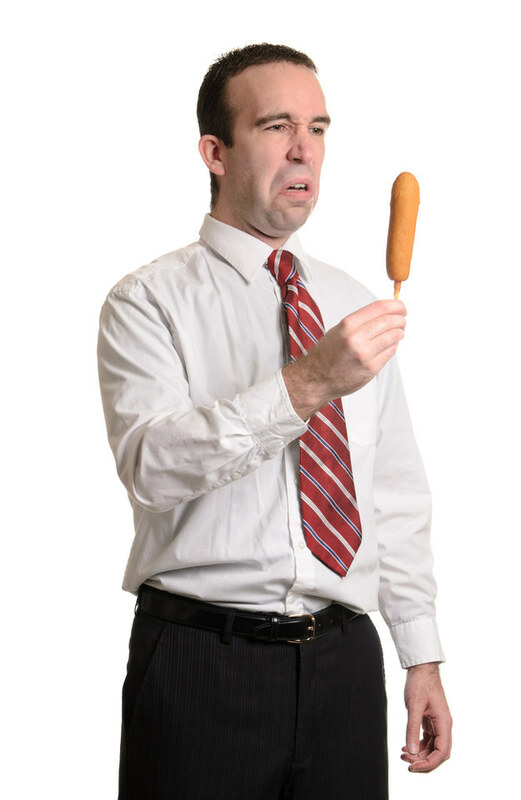 BuzzFeed posted these 50 completely unexplainable stock photos (like the man with the corn dog, pictured left) that had me literally laughing out loud. For the record, I would probably have a similar reaction if someone asked me to eat a corn dog! New bloggers: These are some great tips for blogging etiquette. The Onion is creating its own parody of sites like BuzzFeed and Upworthy, and I’m excited for it to launch! PR and marketing professionals will appreciate this one: 11 ways dating and public relations go hand in hand. In honor of Shailene Woodley’s misguided comments about feminism, enjoy this list of non-feminist celebrities who actually owe their careers to feminism. Loved reading about this young woman’s experience working for Miss Cleo’s psychic hotline. I watched Rocko’s Modern Life as a child, but I never realized how dirty some of the jokes were! What were some of your favorite links this week?